MiR-34a is highly expressed in mature adipocytes of visceral adipose tissues and is elevated in obese mice. (A) Copy numbers of miR-34a in epididymal white adipose tissue (epiWAT), subcutaneous white adipose tissue (scWAT), brown adipose tissue (BAT), liver, and heart of 12-week-old C57BL/6J mice fed with standard chow (STC) (n = 6). (B) The mRNA abundance of miR-34a in epiWAT of mice fed with STC or high-fat diet (HFD) for 0, 1, 8, 16, and 32 weeks (n = 6–8). (C) The mRNA abundance of miR-34b and miR-34c in the epiWAT of mice on STC or HFD for 16 weeks (n = 5). (D) Copy number of miR-34a in mature adipocytes and stromal vascular fraction (SVF) of epiWAT isolated from mice on STC or HFD for 16 weeks (n = 5). (E) The mRNA abundance of Tnfa in epiWAT of mice on STD or HFD for various periods (n = 6–8). 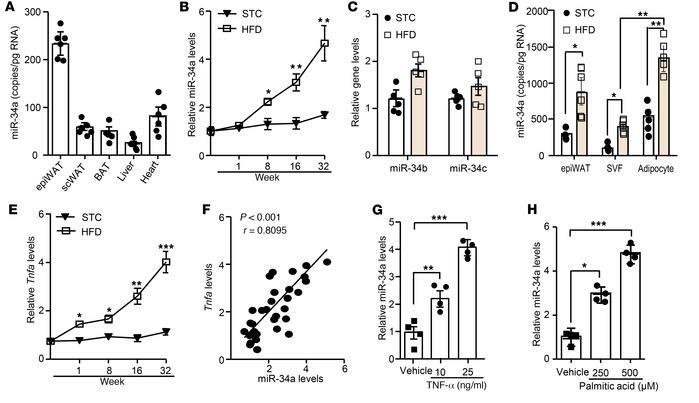 (F) Correlation analysis between miR-34a and Tnfa levels in the same epiWAT of mice after HFD (n = 35). Correlation was assessed by nonparametric Spearman’s test (r = 0.8095, P < 0.001). (G and H) The mRNA abundance of miR-34a in mature adipocytes treated with vehicle, recombinant TNF-α protein (G), or palmitic acid (H) for 24 hours (n = 4). Data represent mean ± SEM. Differences between groups were determined by ANOVA (B–E, G, and H); *P < 0.05, **P < 0.01, ***P < 0.001. Copy numbers of miR-34a were calculated based on a standard curve generated using a synthetic lin-4. Relative levels of miR-34a, miR-34b, and miR-34c were normalized to sno202, and Tnfa mRNA levels were normalized to 18S RNA abundance.